You don’t have to be Celtic to include a handfasting ritual in your wedding ceremony. Tying the knot is something any couple can do. For the guests, my adaptation adds surprise and a little humor. For the couple, a handfasting links them to a tradition both ancient and timeless. Couples didn’t always exchange rings. Before that tradition became popular, a couple might stand at the hearth of a family member’s home, or gather in a place their community considered sacred, often a grove of old trees. Or, they might gather around an object considered significant to the community’s well-being, such as the blacksmith’s anvil. Why the blacksmith? He was the one who forged links and tempered metal to make it strong. Before a family elder, village official, or blacksmith, the couple would declare themselves united. To symbolize the commitment, the person in authority would use a cord to fasten, or “fast,” their hands together. The couple would then work to free their hands. Chelsea and Bill position their arms for the handfasting. Tying the knot was an art in itself. I can only assume there were many versions. I’ve adapted a version for my handfastings. I do the binding. The couple pulls the cord. When they do, it forms a lovely knot to symbolize their joining. Black, tan, and gold echoed the couple's Gatsby theme. Before I explain the binding, a few words about the cord. Any form of rope or ribbon will do if the officiant is the one tying the knot after a single pass over the couple’s wrists. My method of handfasting gives that honor of tying the knot to the couple themselves. That makes the cord an important accessory. My cords are nine feet long, enough for me to make five bindings around the couple’s arms. Having so many bindings is important to achieve a substantial knot. I make my cords with layers and layers of ribbon and assorted trims of lace, braid, and sometimes tiny rosebuds. Having those multiple layers thickens the cord and will give substance to the knot. My cords all have beaded fringe on both ends. The beading isn’t just for decoration. The fringe creates an obstacle for the couple. It could tangle them if they don’t proceed slowly and work together. To begin, the couple faces each other and extends their arms, palms up, so that the fingertips of Couple A are at or near the bend of the elbow of Couple B, and Couple B’s fingertips are at or near the bend of Couple A’s elbow. Karla & Anthony prepare to tie the knot. And so the binding is made. I'm standing behind the two of them, Couple A on my right, Couple B on my left. I begin the binding by having Couple B hold with the thumb about a two-inch piece at one end of the cord. I ask the couple three questions each. With each answer, I wrap the cord around their arms. My goal is to get 5 bindings. Rehearsed the handfasting with Jennifer & Chris –without actually tying the knot! At the last binding, I tuck the last two inches of the cord under the thumb of Couple A. If we’ve done a rehearsal, the couple knows how important it is for them to grip the ends of the cord with their thumbs. If no rehearsal, I emphasize the importance now. Siusi and Mike are almost ready to tie the knot. Now I invite them to do as couples have done for centuries and tie the knot. With a nine-foot cord, the temptation is to step back. Ah, but they can’t distance themselves from the task. They must stand together. They need to proceed slowly as they wiggle their hands through the multiple bindings. The goal is for their hands to pass through the middle of the ribbon coils at the same time. It isn't a race! Each has to adjust to the other. One might have to help the other with a strategic wiggle. As they free their hands from the loops and continue to pull on the cord, the knot forms in the middle. Its appearance often elicits applause. Handmade. One of a kind. For more info or to purchase, please visit my shop on Etsy. You can see the cords I have for sale on Etsy (Moon River Rituals). To see the custom cords I’ve made for my couples, please see Pinterest (ZitaMRR). Lemon chiffon and cornflower blue blend in this cord for Siusi and Mike. What about you? If you include a handfasting ritual in your wedding ceremony, or if you’re having a handfasting as a ritual of commitment, please send me a picture. Let’s bring back the beauty of this timeless tradition. 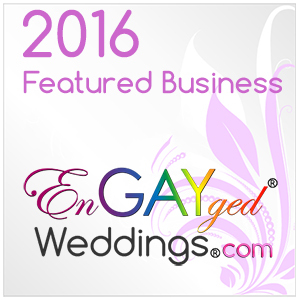 This entry was posted in Ceremony Ideas, Cultural Traditions, Handfasting, Life in General, Weddings. Bookmark the permalink. Thanks, Laura. That means a lot. I’ve heard it said that, in nature, the presence of a knot indicates a concentration of power. When I watch one of my couples tie a knot that’s exactly what I’m thinking. They’re gathering the power they’ve just raised by taking vows and exchanging rings. Such a beautiful moment.